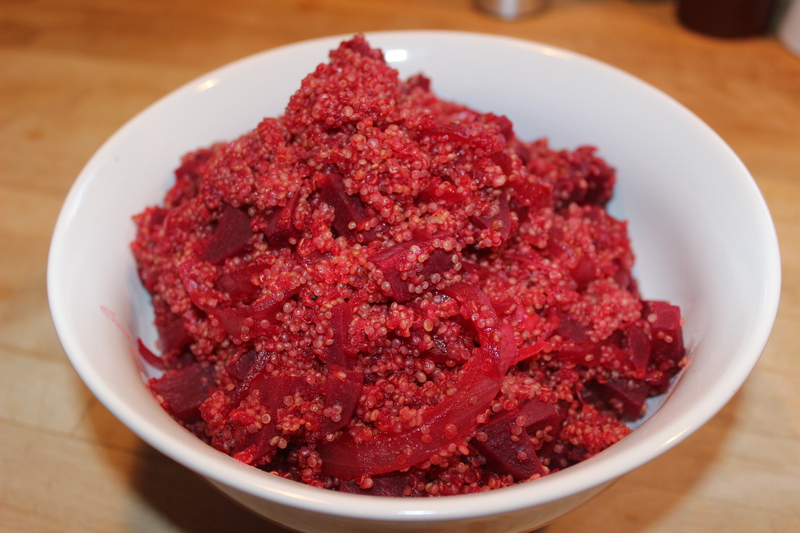 Beet Red Quinoa | Mommy. Foodie. Athlete. We did it! Our very own beets from our garden! I love beets, but get stuck making the same dishes over and over. I decided to try something new, and I sure am glad that I did! If you aren’t here for the paleo version, stir in some crumbled goat cheese for a treat! 1. Heat olive oil in a large saucepan. Stirring frequently, sauté onion for 5 minutes or until it begins to caramelize. 2. Add apple cider vinegar and stir to deglaze the pan for about one minute. 3. Add beets, chicken stock, and quinoa. Bring to a boil and reduce heat to a simmer while stirring occasionally until all liquid is absorbed and quinoa is cooked. Beets are the best! This looks delicious!